If you're a regular user of Facebook, you're no doubt familiar with sponsored ads popping up in your Facebook News Feed, woven in with posts you care about from your friends and family. And chances are you're not happily smiling when you see them, unlike these two ladies in a Facebook ad promotion. You just want the ads to stop. Unfortunately, there is no direct way to stop ads from appearing in your News Feed. However, by understanding the ways advertisers use targeting to determine who sees their ads, you can use that same information to make yourself undesirable to advertisers and, therefore, far less likely to see ads in your News Feed. Location—Leave your address blank or change to a foreign location unlikely to be targeted by advertisers (e.g., Guam). Interests—Facebook lets advertisers target people who have "expressed an interest in" or Liked pages related to a topic. So the fewer pages you Like or comment on, the less likely you will be targeted by advertisers. Age—Age is a heavily used factor in ad targeting. However, few advertisers are targeting centenarians. So add 100 years to your age. Born in 1974? Let's change that to 1905 (the farthest back Facebook allows you to choose). Gender—Did you know that in addition to "male" or "female" (which are widely used as targeting factors) Facebook also allows to pick a "custom" gender? I'm sure you can come up with something interesting for this one. 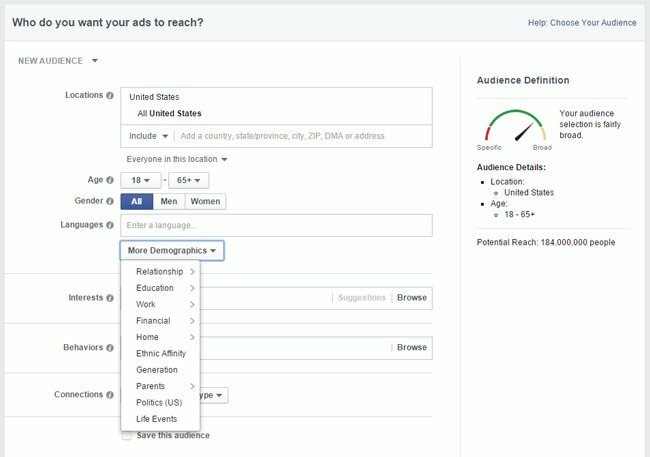 Other demographic factors, such as Language, Relationship, Education (including fields of study), Work (employers, job titles, industries, office types), ethnic affinity, Parents, Life Events (engagements, long distance relationships, Friends of newly wed) can also be used for ad targeting. So, the fewer of these items you have in your profile, the less likely you are to be targeted. This one is pretty basic: "Like" pages about heavy metal music? You're going to get targeted for the new Metallica album. Be judicious with what pages you Like to limit how often you will be targeted. Facebook knows if you're currently traveling by comparing your Facebook logins with your home location. Facebook knows if you're a baseball fan, by analyzing how often you interact with baseball content. FaceBook knows if you have a child who is about to graduate from high school, by analyzing your relationships and the age and education status of those relationships. Facebook knows if you've recently purchased a new home. This is a trickier area to manage. Unless you stop posting and interacting with content—which is the whole purpose of being on Facebook in the first place—this data is out there on you. Again, by limiting the demographic information you provide and reducing extraneous interactions with pages, it makes it more difficult for Facebook to extract behaviors that advertisers can target. You know exactly who I'm talking about. That annoying friend of yours who, for some unknown reason, insists on Liking pages from dozens of major advertisers, like Applebee's or Starbucks. And since Facebook allows advertisers to target "Friends of people who like your page", now you're seeing Applebee's ads in your news feed. You often know if you were targeted based on a friend who likes a page because the name of your friend shows up in the ad. How do you stop this? Yell at your friend to stop serial liking pages. They deserve it. Turn off “Pair my social actions with ads” so your name isn't used in ads to your friends. Or else your friends will yell at you. And you will deserve it. You look at a pair of shoes on Amazon and then every site you go to has ads for that same pair of shoes. In advertising parlance, that's "retargeting". Facebook allows advertisers to "retarget" people who have visited the advertiser's website or app off Facebook, which may result in more ads showing up in your news feed. If you don't want companies to use information based on your activity to target ads, you can opt out through the Digital Advertising Alliance (US), Digital Advertising Alliance Canada or the European Digital Advertising Alliance. Because retargeting uses browser-based cookies, you will need to opt out for each browser you use (mobile and desktop). However, for Facebook specifically, you only need to opt out in one browser and it will automatically apply your choice everywhere you use Facebook. Funny how your site also shows targeted adds that are obviously pulling from some of the same sources as FB. I guess that’s why you’re so informed. It’d be nice if ALL sites stopped this, or at least the the ones with articles belittling FB for things they themselves seem to be doing. Kudos though for getting around Adblock by embedding them in your site directly. Not many sites have figured that one out yet. How Do I Avoid PAGE CONTENT BLOCKERS? This is my first experience of having a page that I opened to view blocked with a large pane of text stating that I would not be allowed to view the content unless I took off my ad blockers. I was trying to look up information, as I had been perusing several posts, looking for updates on Senator John McCain’s recovery when the huge screen popped up blocking the view of text and stating that I would not be allowed to see the text because I was using ad-blockers. How do you block CONTENT BLOCKERS that keep you from reading text on a news feed or a poster’s page? Blocking ALL ads on Face Book is relatively easy. Just install Adblock Plus this has now started automatically blocking the annoying stuff that appears in your news feeds ... brilliant ..... and if you click the Adblock plus logo and select “Block element” then point mouse over bits you want to block until the unwanted section turns yellow then just accept.